The Cisco PIX firewall appliance at Devine Millimet, Attorneys at Law, needed replacement. The SurfControl web filtering they utilized came under question when the service was bought out by Websense. There was no backup or failover solutions in place. Security was scattered, and network protection needed to be brought up to speed. 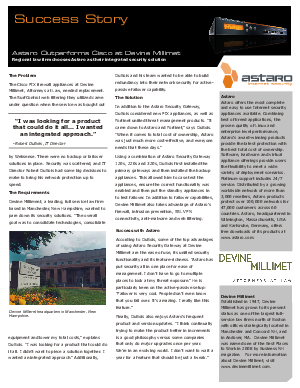 Download this free case study and find out why Devine Millimet selected the Astaro Security Gateway and how they continue to enjoy frequent product and version updates, rather than the typical major upgrade once a year, as seen from other vendors.